A neighbour asked for a wedding card, and I found this fun stamp just a few weeks ago in a Swedish craft shop - so this was the perfect moment to let it see some ink! I stamped the image with Black Memories ink and colored it with the Gamsol Magic technique (well, or something like that, we don't have Gamsol or Prismacolor crayons in Germany, so I used my Karisma and Polychromos crayons and some odorless terpentine). I added highlights with some crystal laquer (clear and red) and white stickles. The border is punched with a Fiskars Border Punch, I added the little white dots in the holes with a white gelly pen. The main image is from Panduro, the sentiment from LaBlanche and the little hearts from Kaleidoskop. I used red Adirondack hues for sponging, red HeroArts pigment ink for the sentiment (I embossed it with clear powder) and red ColorBox Fluid Chalks for the little Hearts. 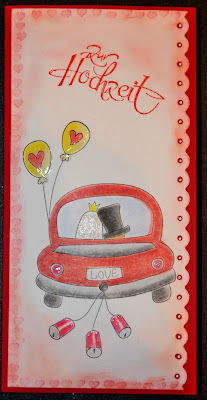 This is a very easy card - only two layers, no design papers, no ribbons... nevertheless, I like this fun car - what do you think? that is an awesome wedding card!!! what a great image to stamp!! love the edging! they must have loved this card!! !